The attack seemed singularly horrific: an Egyptian pharmacist, Marwa el-Sherbini, was testifying during an appeal hearing in a Dresden courtroom on July 1 when a Russian émigré, Alex Wiens, lunged at her with a 7-in. kitchen knife. The pregnant mother was stabbed to death as her husband and 3-year-old son looked on helplessly. After protests swept the Arab world, Wiens was sentenced in November to life in prison for what the court deemed a racially motivated murder. Though shocking in its brutality, the attack was not an anomaly in Germany. Authorities say the country has experienced a disturbing rise in extreme-right-wing violence in recent years. 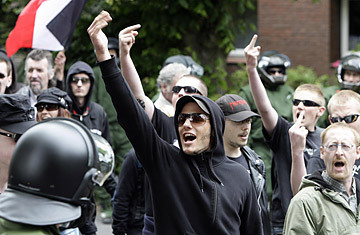 The Federal Criminal Police Office (BKA) said in a report released last week that politically and racially motivated crimes by the far right hit a record high of more than 20,000 in 2008. Figures for 2009 won't be released until early next year, but the BKA expects them also to be above normal. "On average, two to three far-right-motivated violent crimes are committed in Germany each day. And there are around three to four anti-Semitic violent crimes each month," says Jörg Ziercke, president of the BKA. "There's a real danger to people's lives because far-right attacks tend to be very spontaneous, brutal and violent." Right-wing radicals have become increasingly brazen too, carrying out attacks in public places such as train stations, bus stops and outside bars and restaurants. In addition to el-Sherbini's murder, Ziercke says, there were five politically or racially motivated attempted murders by the far right in 2009. According to the BKA report, formerly communist eastern Germany has become a fertile breeding ground for far-right extremism. Twenty years after the fall of the Berlin Wall, many eastern regions are still struggling with high unemployment and deep-rooted social problems, and residents have increasingly turned to far-right political parties like the National Democratic Party (NPD). Attacks are common there too. Two years ago, a 50-person mob yelling, "Foreigners out!" chased eight Indians through the streets of the eastern town of Mügeln before brutally attacking them in a pizzeria while townspeople looked on. Fourteen people were injured in the melee, including all eight Indians and two police officers, according to media reports. Some experts believe that organizations like the NPD may be a driving force behind the rise in violence. A study published recently by the Hannah Arendt Institute for Research on Totalitarianism, in Dresden, found close links between the NPD and far-right radicals in the eastern state of Saxony, where the NPD entered the regional parliament after winning 9.2% of the vote in a 2004 election. Researchers said there was a steep rise in the number of clashes between far-right groups and left-wing activists after the vote. "The NPD has successfully recruited young people from the violent far-right subculture and the neo-Nazi Kameradschaften [Brotherhood] groups," Uwe Backes, deputy director of the institute and author of the report, tells TIME. "The left wing has become the far right's No. 1 enemy in Saxony." The NPD officially rejects violence and explicit Nazi references. Nonetheless, the federal government attempted to ban the party in 2003, only to be overruled by the German high court  an embarrassment for then Premier Gerhard Schröder. According to the German intelligence services, up to 30,000 Germans are believed to hold far-right beliefs  and among those, one-third are bent on violence. "It's a shocking situation," Ziercke says. He urged law-enforcement agencies to take stronger actions to prevent right-wing crimes and said courts must start handing down tougher sentences to offenders. The police chief also warned the government against scaling back funding for so-called exit programs, which are designed to help people leave extremist groups. "These people are mostly young, around 24 years old, and they come from difficult family backgrounds, have little or no qualifications and have committed far-right criminal acts," says Ziercke. While in the exit programs, he adds, they rarely commit new offenses. Experts say authorities need to increase monitoring of the Internet as well, as right-wing groups are increasingly turning to the Web to spread their propaganda and messages of hate, often using foreign servers to try to avoid detection. "The problem is that Germany has a stable far-right scene, made up of autonomous nationalists, former skinheads and the NPD  and they're all growing in confidence," Hajo Funke, a professor of politics at Berlin's Free University, tells TIME. "These different neo-Nazi groups interact with one another using the Internet." Ziercke says that in light of the new statistics, police surveillance of extremists should be stepped up dramatically in the New Year. Sadly, for a country that has long tried to live down its Nazi past, the wave of right-wing violence shows little sign of relenting.